Have completed over 1500 WordPress projects since 2007, 500 of which are done on Codeable. Out of those 500, the current state of things sum up with an average of 4.98 stars out of five in the reviews. In free translation that means that since my recruitment in January 2015, I’ve had two 4-star reviews, and one 3-star review. but can also handle pretty much any premium theme you’d like to customize. Can handle any theme related work from simple customization and fixes up to a fully custom designed and built website for your business – small to large. Not much of a talker, so I’m gonna try to keep things simple. If you want to take more time into looking out for what more people said about my work, all the other ~250 reviews are added to the bottom of this profile. Most recent pieces, both design and development related are not available due to NDA. Please feel free to ask me directly about those. What separates Codeable from any other party you can imagine at the moment is actually the personal touch on all things around it, and a strong community at the same time. Interested in hearing more? Here’s a link to my own personal Codeable story, so please enjoy! 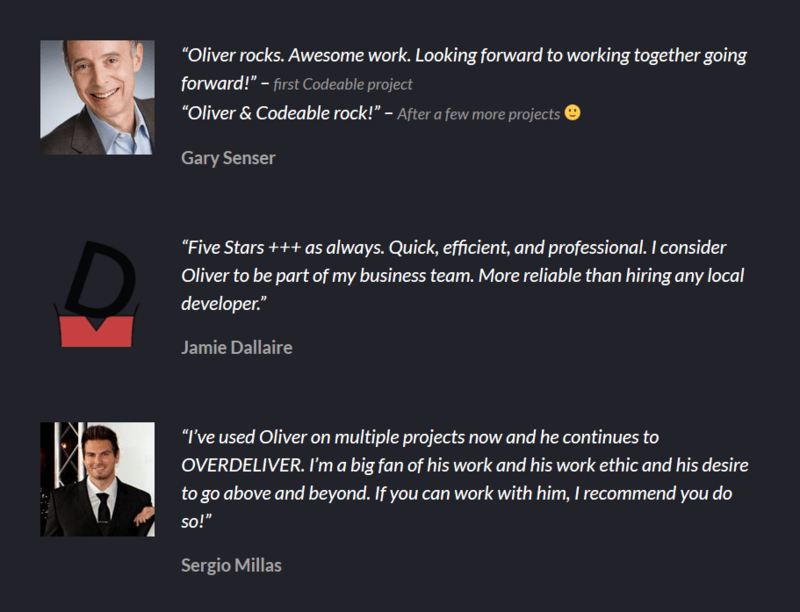 Talk about communication - if Oliver is what Codeable is about, then I'm in. Great experience, Oliver is a gracious Wordpress master willing to explain, expound on, and work with any and all requests I had. Really great experience and I look forward to working with both Codeable and Oliver again in the very near future. I joined codeable with specific idea in mind on how I wanted my WordPress Child Theme to look.Oliver was assigned to my consultation and quickly understood my vision. He then laid out the scope nice and clear and it wasn't long until he was delivering what I needed.His communication was clear and timely.I look forward to working with Oliver again in the future. Five Stars +++ as always. Quick, efficient, and professional. I consider Oliver to be part of my business team. More reliable than hiring any local developer. Excellent work, timely and helpful suggestions - thank you Oliver! Oliver went above and beyond to verify that things were working correctly. Oliver was outstanding to work with. Very experienced, highly qualified for this request and very responsive in his communication style. I would highly recommend his services!! This has been an ideal experience. Oliver did a great job communicating and following the exact specifications of the job. I am impressed and look forward to working with him again.